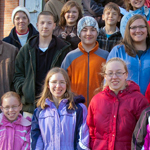 Last month a group of homeschoolers from New York took a field trip to the VA Medical Center in Bath, N.Y., where Chaplain Jerry Hamblin serves. He met with the students and their parents, answering questions about military and veterans affairs chaplaincy, and about the VA in general. Their tour included the medical center’s museum, which features displays of military service from various eras. Chaplain Hamblin reports that the students enjoyed the experience and that their parents would like to bring them for another visit, next time during warmer weather so they can also tour outside the buildings. Posted in Chaplain News, GARBCnews, Institutional Chaplains on December 4, 2013.